Benjamin Franklin Wilbour, Little Compton Families, , at https://books.google.com/books?id=A5T3atymDIoC . Baltimore, Maryland: Clearfield Company, Inc., (2005) , p. 531. John Salisbury of Llanrhaeadr, Wales was born perhaps about 1590. 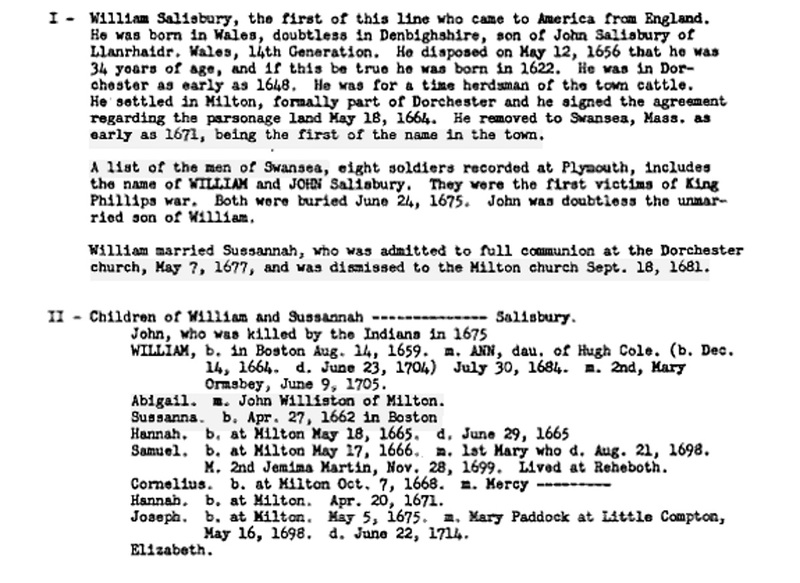 John Salisbury was born perhaps about 1655. 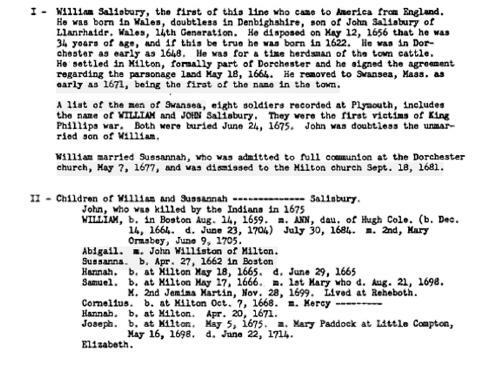 Martha Salisbury was born perhaps about 1698. 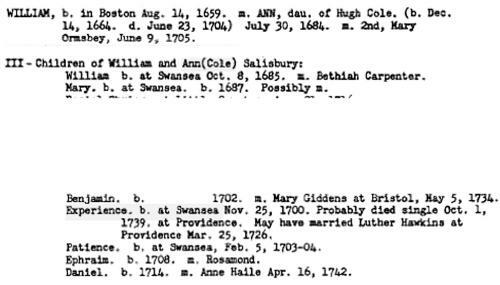 "Massachusetts Births and Christenings, 1639-1915," database, FamilySearch (https://familysearch.org/ark:/61903/1:1:FZDZ-LX7 : 4 December 2014), Rachel Salsbery, 12 Aug 1706; citing SWANSEA,BRISTOL,MASSACHUSETTS, ; FHL microfilm 0022366 IT 3. Rebecca Salisbury was born perhaps about 1711. John D. Austin, Mayflower Families Through Five Generations, General Society of Mayflower Descendants, (1992) , p. 238. "Ohio, County Death Records, 1840-2001," database with images, FamilySearch (https://familysearch.org/ark:/61903/1:1:F6F7-6MT : 13 December 2014), Almira Pixley, 11 Oct 1906; citing Death, Toledo, Lucas, Ohio, United States, source ID cn 12040, County courthouses, Ohio; FHL microfilm 1,653,150. Joel H. Salmon was born perhaps about 1795.